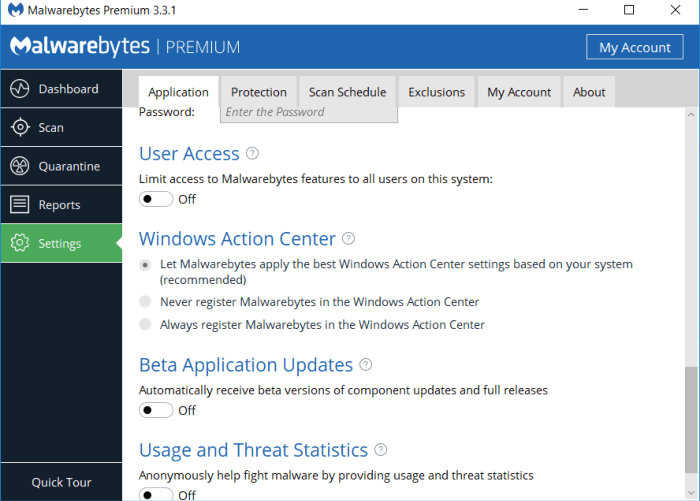 Malwarebytes is not just an antimalware product but it is now a security software to replace your antivirus. Malwarebytes was previously an antimalware software but with some recent updates it has now going on the way to become an Antivirus. Now they are saying that a user do not require to install two software (Antimalware + Antivirus) but their software do the work of both the software. With this capability Malwarebytes register itself as an antivirus in windows 10. So windows defender automatically turn off its real time protection. It can also conflict with other antivirus as Windows is detecting that there are two antivirus are installed in the PC. However still Malwarebytes does not conflicting with other Antivirus software if Windows does not detect it as an Antivirus. To do this and to avoid this conflicting in Malwarebytes version 3.2 a new feature has been introduced to control this. In application scroll down and find the Windows action center settings under this you will see 3 options to choose from. Ensure ‘Always register malwarebytes in the windows action center‘ is not selected and set the settings to ‘Never register malwarebytes in the windows action center.’ Or ‘Let Malwarebytes apply the Best settings‘ option. From version 3.3 now Malwarebytes can also detect the best settings automatically and conflicting possibilities are very rare. Share your experience in the below comment box if you have any experience regrading conflicting issue.